Humans have been storing, retrieving, manipulating and communicating information since the Sumerians developed writing in about 3000 BC, but the term information technology in its modern sense first appeared in a 1958 article published in the Harvard Business Review; authors Harold J. Leavitt and Thomas L. Whisler commented that "the new technology does not yet have a single established name. We shall call it information technology (IT)." Their definition consists of three categories: techniques for processing, the application of statistical and mathematical methods to decision-making, and the simulation of higher-order thinking through computer programs. Based on the storage and processing technologies employed, it is possible to distinguish four distinct phases of IT development: pre-mechanical (3000 BC - 1450 AD), mechanical (1450-1840), electromechanical (1840-1940) and electronic (1940-present). This article focuses on the most recent period (electronic), which began in about 1940. Electronic computers, using either relays or valves, began to appear in the early 1940s. The electromechanical Zuse Z3, completed in 1941, was the world's first programmable computer, and by modern standards one of the first machines that could be considered a complete computing machine. Colossus, developed during the Second World War to decrypt German messages was the first electronic digital computer. Although it was programmable, it was not general-purpose, being designed to perform only a single task. It also lacked the ability to store its program in memory; programming was carried out using plugs and switches to alter the internal wiring. The first recognizably modern electronic digital stored-program computer was the Manchester Small-Scale Experimental Machine (SSEM), which ran its first program on 21 June 1948. The development of transistors in the late 1940s at Bell Laboratories allowed a new generation of computers to be designed with greatly reduced power consumption. The first commercially available stored-program computer, the Ferranti Mark I, contained 4050 valves and had a power consumption of 25 kilowatts. By comparison the first transistorized computer, developed at the University of Manchester and operational by November 1953, consumed only 150 watts in its final version. 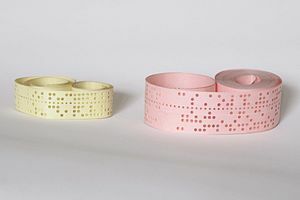 Punched tapes that were used in early computers to represent data. The terms "data" and "information" are not synonymous. Anything stored is data, but it only becomes information when it is organized and presented meaningfully. Most of the world's digital data is unstructured, and stored in a variety of different physical formats[b] even within a single organization. Data warehouses began to be developed in the 1980s to integrate these disparate stores. They typically contain data extracted from various sources, including external sources such as the Internet, organized in such a way as to facilitate decision support systems (DSS). Massive amounts of data are stored worldwide every day, but unless it can be analysed and presented effectively it essentially resides in what have been called data tombs: "data archives that are seldom visited". To address that issue, the field of data mining - "the process of discovering interesting patterns and knowledge from large amounts of data" - emerged in the late 1980s. In an academic context, the Association for Computing Machinery defines IT as "undergraduate degree programs that prepare students to meet the computer technology needs of business, government, healthcare, schools, and other kinds of organizations .... IT specialists assume responsibility for selecting hardware and software products appropriate for an organization, integrating those products with organizational needs and infrastructure, and installing, customizing, and maintaining those applications for the organization's computer users."
? On the later more broad application of the term IT, Keary comments: "In its original application 'information technology' was appropriate to describe the convergence of technologies with application in the broad field of data storage, retrieval, processing, and dissemination. This useful conceptual term has since been converted to what purports to be concrete use, but without the reinforcement of definition ... the term IT lacks substance when applied to the name of any function, discipline, or position."
? "Format" refers to the physical characteristics of the stored data such as its encoding scheme; "structure" describes the organisation of that data.
? "Free on-line dictionary of computing (FOLDOC)". Retrieved 2013.
? Wang & Taratorin (1999), pp. 4-5.
? "Americas events- Video animation on The World's Technological Capacity to Store, Communicate, and Compute Information from 1986 to 2010". The Economist.
? 33.0 33.1 Pardede (2009), p. xiii.
? Pardede (2009), p. 4.
? Lewis (2003), pp. 228-31.
? Bynum (2008), p. 9.
? Reynolds (2009), pp. 20-21.